We have organized a Union Church with chaplain John D. Beugless as Pastor. We have to start 26 members. We have also organized a Sunday School, and Adjutant Elisha H. Rhodes is Superintendent. Lieut. 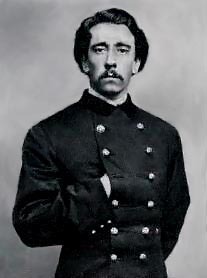 John M. Turner has a class of contrabands, mostly servants to the officers. We hope to do much good in the Regiments and pray that God will bless our labors. 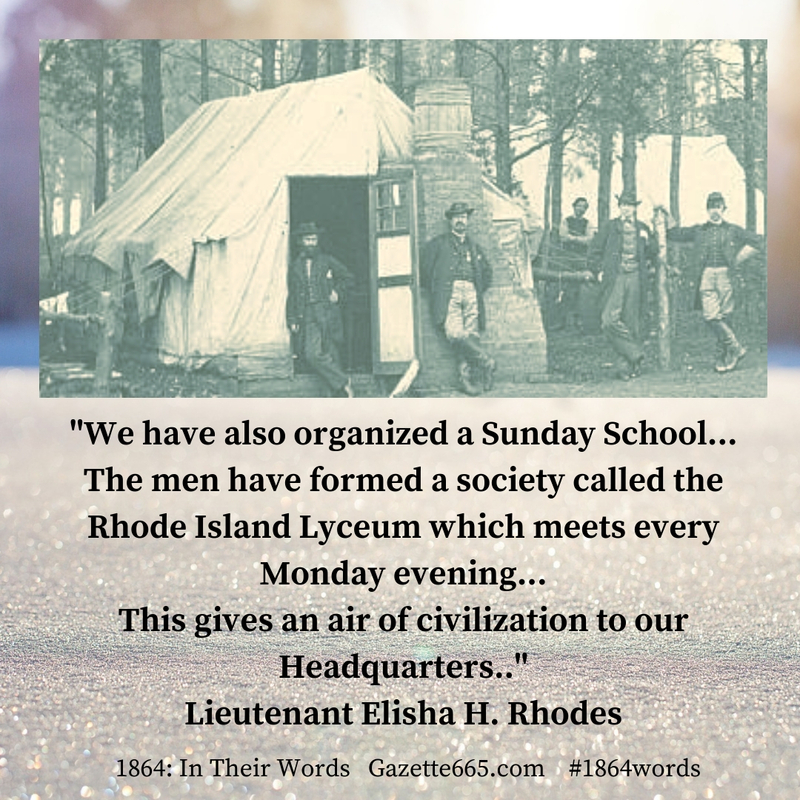 The men have formed a society called the Rhode Island Lyceum which meets every Monday evening. Spelling schools and lectures will be held every evening, so our time will be well occupied. Several ladies are now living in camp. Mrs. Henry C. Jencks, wife of Major Jencks, Mrs. Edward A. Russell, wife of Capt. Russell, and Mrs. Amos M. Bowen, wife of Lieut. Bowen. This gives an air of civilization to our Headquarters. A few nights since we had a very interesting lecture from Rev. J. Wheaton’s Smith, D.D. of Philadelphia. He lectured on his travels to the Holy Lands. The men were delighted with the new departure. The religious interest still continues, and we hope for good results from our labors. Hurrah! We start for home today. The following officers are in the party: Capt. John P. Shaw, Adjutant Elisha Hunt Rhodes, Lieut. Edmund F Prentiss and Lieut. Thorndike J. Smith. We are to have thirty-five days leave of absence. Elisha H. Rhodes, Private Journal, January 23-February 10, 1864. Yeah, it’s February, but these two February diary entries did not quite make sense without the previous journal entry from January. Viewed together, an image of winter camp experiences and highlights starts to emerge. The day-to-day activities like picket duty, chopping wood, thawing water, cooking, trying to stay warm, writing home, cleaning weapons, and huddling in wool jackets and capes, fades as Elisha Hunt Rhodes tells about the exciting happenings in his life and camp. It’s during the winter months that culture flourished in Civil War camps. Sure, there’s always “military culture,” but in the cold season as men had extra time, they invented novel ways to entertain themselves or found opportunities to recreate activities they had enjoyed at home. In the 2nd Rhode Island regiment’s camp, the Union boys constructed a chapel for the purpose of religious fellowship and evangelism to their comrades. Others – more interested in secular pursuits – created a lyceum which hosted spelling bees, lectures, and debates for a form of educational entertainment. Finally, if officer’s wives came to military camps, they typically came in winter, and Rhodes notes how the women’s presence added that additional civilizing effect. Undoubtedly, uniforms were better kept, tones and words became less rough, and the officers brushed off their manners to welcome the ladies. Civil War soldiers didn’t just leave camp and go home without permission. Or they didn’t do that without risk of getting caught and court marshaled. Desertion – or even appearance of desertion – was serious matter. However, winter was usually the quieter season of war with fewer battles and campaigns. Thus, many officers and soldiers managed to obtain leave of absence to visit family and friends. There was paperwork to fill out, then trains to catch, and the anticipation of getting home! Happily for Lieutenant Rhodes and his fellow officers, they managed to get their leave extended through April 1864, giving them quite a rest from camp and war before the spring campaigning began again. Here are twenty-six guys in a Union regiment that has already seen heavy fighting and each sunrise and sunset of that winter of 1864 brought them closer to the hardest campaign yet. Of course, they didn’t know what we now read in the history books about the spring of 1864, but they had to know another campaign loomed ahead. Hope. That name really stands out to me. They had religious hope. They had hope in an ultimate Union victory. Hope they would see their loved ones again. Some would not live to see final victory or home again, but would instead realize the fullness of their religious hope. In the dark winter with more fights in the coming months, these soldiers clung to their faith, firmly believing that better days on earth or in eternity would come and prepared to encourage each other while also witnessing to their comrades. Why can’t I respond with a heart emoji? Aww…that would be fun. Thanks!